The Burg, an online community platform for local news and political discussions, will be hosting a town hall Friday afternoon with Long Beach’s social media-savvy Mayor Robert Garcia. 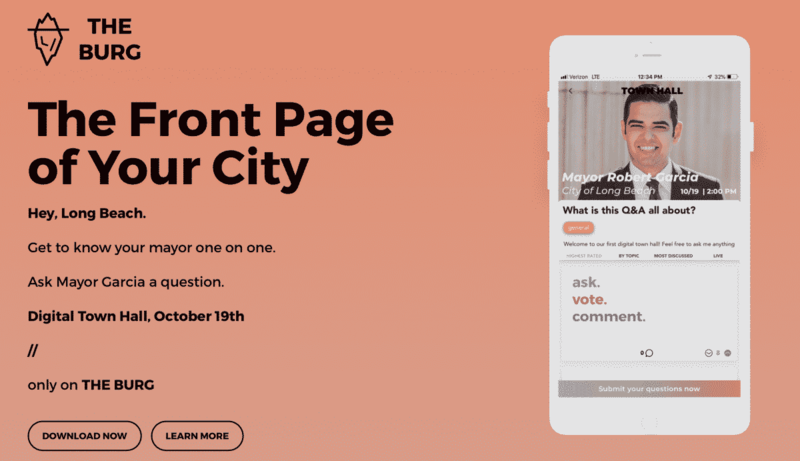 Users of the app, which launched in early April, will be able to submit questions to the mayor who is expected to respond and engage his constituents at 2 p.m. The questions can include anything from food recommendations to city issues—just don’t ask questions about ballot measures AAA, BBB, CCC and DDD because he will not be answering them, according to a release from Burg. Since the mayor will be responding to questions from City Hall he is prohibited from campaigning using city resources, said Garcia’s chief of staff Mark Taylor. Community members will be able to “upvote” or “downvote” questions to make sure the best ones can get answered by the mayor. When the town hall is live, Garcia will be able to engage app users via threaded public comments. To download or learn more about the app, click here.